Our HDAFU tables have evolved tremendously over the years – the 5th Generation of Summer Leagues is now available for sale. To help you understand why we value this product so highly, here is the Definitive Guide for using the tables to their maximum potential. Just click on the button above and click on “Continue Checkout” button in the new tab, then enter your name and e-mail address. Our automatic store will then deliver the file to you via e-mail, free of charge. The size of this Excel workbook is 864 KB. It’s difficult for us to put into words how we feel about the HDAFU tables, but we do know they are very special inventions. Quite simply, they are the best and most user-friendly tools available for nailing down value betting systems in every league you apply them to. They reveal the DNA of a league, and provide a hidden level of detail that makes finding and exploiting the sweet spots so easy and so rewarding. The first thing you will see when opening any of the HDAFU tables is the Data Tab summary of each bet type. The totals along the top row show the effects of betting on every match over five seasons to be (from left to right) either a home win (-7,329), a draw (-835), an away win (+8,236), or wins for the favourites (-2,594) or the underdogs (+3,501). You can see from this graphic that away wins look the most promising backing system with a profit of 8,236 units from 100 unit stakes. To customise the stake amount enter what you want in the Fixed Stake box at the top of each bet type in the Data Tab. The image above shows the full five season cold analysis. If you enter a different stake amount the financial values will change, but the percentages will always remain the same. This being the case, we have fixed these percentages as a benchmark to better gauge the improvements we will make with our filtering exercise later. The Odds Toggle is for testing the effects of the odds you are getting when playing the systems for real – you can ignore it during your analysis. You can also leave the betting exchange commission rate at zero. Again, use it for backing system monitoring purposes when you start betting on or paper testing your systems of choice. Okay, we fancy away wins in this particular league but let’s now have a look at the Inflection Points Tab to see if this backs-up our observation. Away wins are certainly financially the most profitable bet type but the profit curve doesn’t really begin rising until odds of 3.30 are reached. Overall profit at this point is 463 units and this rises to a peak of 13,502 units around odds of 8.60. These two points on the graph would therefore be our two inflection points: Odds of 3.30 where the curve begins to rise; Odds of 8.60 at the pinnacle, the point at which profits begin to fall again. However, notice there is a big portion of the away wins curve which is a zero-sum game. This ‘hole’ in our profit curve begins around odds of 3.75 (6,653 units). At this point, the curve falls away again, encounters what we call ‘statistical noise’, and only recovers at odds of around 6.52, when the profit figure surmounts its previous high at 7,184. In between these two points is the potential for a lot of wasted effort and not a lot of gain. We can see the extent of this by scrolling down and looking at the inflection point intervals. 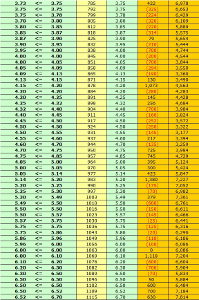 This image shows the start of the 3.75 odds sector at the top and the end of the 6.52 odds sector at the bottom. The yellow column indicates the running total of matches up to each cluster of matches. We can see that our two odds of 3.75 and 6.52 encompass roughly 330 matches – the difference between 1,115 indicated at the 6.52 break-off point and 785 at the starting point of the 3.75 cluster. That’s 330 bets over a five season period that are simply not worth making; or 66 bets in a season. We can see this clearer by looking at the same snapshot between our original inflection points of 3.30 and 8.60. In this odds range, we have roughly 587 bets (1,221 minus 634). We now know that more than 56% of these (330 bets) are not worthwhile making. This leaves only 257 bets but the away win profit sectors between the inflection points seem to be split into two areas of the curve: from odds of 3.30 to 3.75 (medium risk system, accounting for around 160 bets), and then from odds of 6.52 to 8.60 (high risk system; around 100 bets). If we were to continue our analysis of away wins we would eventually see that the three elements (the medium risk sweet spot, the high risk sweet spot, and the statistical noise in-between) combine to give us a bumpy ride. Our expected hit-rate will be tempered by that area of noise, and yield will be lower because of the size of the zero-sum area and the number of pointless bets within it. This means a lot of unpaid work to perform, placing many bets that maintain the status quo and not much else. On top of this, the losing streaks will be greater. Therefore, why not split into two systems in this league? The synergy we have mentioned before about many systems supporting each other is what makes the HDAFU betting systems so viable. However, we also mentioned that you should find the single best system in a league to play alongside the other best systems in the other leagues within your portfolio. In our away win example, we would need to choose the better of the two systems we have identified. Either backing away wins at odds between 3.30 and 3.75, or between 6.52 and 8.60. Choose one or the other, not both. We recommend never to play multiple systems in the same bet type. The synergy effect is diminished as ultimately, one of the two systems is not the best we can find. Ideally, we are looking for synergy between the absolute single best systems in each league within our portfolio, without creating a situation where one system supports another within an individual league. With different bet types in the same league (e.g. 1×2 market and over/under goals market) this is not an issue, but we would go as far as avoiding the conflict of interest between HT and FT 1×2 systems in the same league, for example. Away wins initially looked great but is there something better? Have a look once again at the Inflection Points graphs to try and see what it is. As is typical of an underdog backing profile, the high risk/high return nature of this bet type produces a noisy curve, one full of jagged peaks and troughs. There are only small rising areas to analyse. Anything you can analyse into promising profits will contain few betting opportunities in a season, with long runs of losing bets to cope with. Backing the favourite has one area between odds of 1.90 and 2.10 but we can see at these odds not a huge profit is created over five seasons (less than 3,500 units). The home win is a misery for backing. Again, the sweet spot is between 1.90 and 3.10 but the profit is less than 2,000 units. That leaves us with backing the draw. 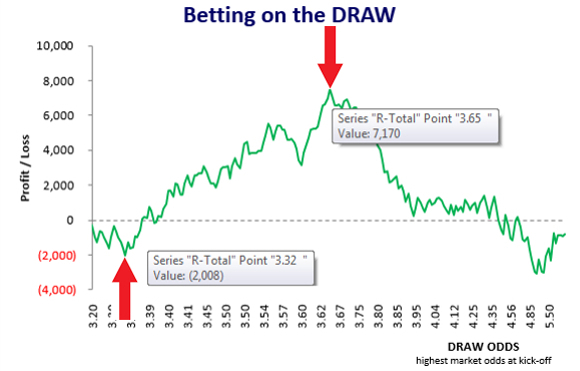 There is a large, rising area in the curve beginning at draw odds of 3.32 (-2,008 units), and peaking at 3.65 (7,505 units). It represents a potential profit chunk of 9,513 units. The shape of this curve is what you should be looking for when identifying the first system to analyse in your leagues of choice. It is the classic gently rising curve from bottom left to top right. It is relatively smooth, with a far smaller amount of statistical noise. Therefore, this is the bet type we will analyse as our example.